More than 100,000 people descended upon the promenades and other vantage points of Plymouth Sound to witness the 19th year of the British Fireworks Championship. Visitors were welcomed with an exciting schedule filled with entertainment including live stage music, a funfair and a two-day contest which featured six leading professional fireworks display companies from various parts of the country. They were 1st Galaxy Fireworks from Nottingham, Phoenix Fireworks from Kent, Gala Fireworks of Northampton, Spyrotechnics in Chesterfield, Essex Pyrotechnics from Essex and Fantastic Fireworks, based near Luton in Bedfordshire. Fantastic Fireworks, which celebrated its 30th anniversary the same year, won the highly-prized title by presenting an innovatively spectacular display (pictured above). It’s not the company’s first championship victory as they were winners of the inaugural competition back in 1997 and have made an appearance in many prestigious events since, including the Cannes Fireworks Festival, the Cannes Film Festival and the Isle of Man TT Festival. The enthusiastic team were prepared and present on the first day of the contest to witness their rivals’ displays on the Mountbatten breakwater. There was a pleasant atmosphere and competitors enjoyed presenting their displays in clear skies. ‘I thought that Spyrotechnics were particularly good and was fairly confident that they would be in the frame at the end,’ stated Willsher. The following evening, Fantastic Fireworks were up against Gala Fireworks and 1st Galaxy Fireworks. 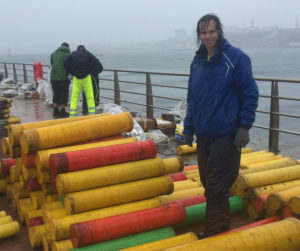 Senior display manager and senior firer, Rino Sampieri, explained that the team began preparing at the crack of dawn and were faced with extremely wet and windy weather. But this wasn’t the only challenge Fantastic Fireworks were faced with. ‘We normally use scaffolding and didn’t have enough on the day so instead we used our initiative and made ladder racks to insert and position the tubes within,’ said Willsher. Willsher had also added a humorous touch to the display. ‘I purposely made a mistake in the show by putting in a sad face. So, at the bottom we had fireworks going off and I put in the wrong colour and the idea was to make a mistake, to have the sad face, but then get it right and put up happy faces.’ At the time Willsher was disappointed that this may not have been presented clearly to be appreciated by both the audience and the judges, however he later received positive feedback from a private client claiming that he had done a fantastic job! A favourite among the crowd was the red heart sequence at just under two minutes into the show. This was an innovative bit of artistry achieved by carefully-angled and precision-timed red stars fired from single-shots to create a fleeting image of a giant red heart. To reinforce the image Willsher added a sequence of actual red heart shells over the top, the combination of which drew ripples of recognition and appreciation from the audience. Despite the many challenges they were faced with, the team pulled through to put on an outstanding display. Being first on they were then able to enjoy a side view of the competitors’ displays before the results were announced. ‘We had to get a ferry ride over to where the winners were announced and by then we were starting to feel really good. We knew we were up in the top three and were fairly confident that we were going to be joined by 1st Galaxy Fireworks. With no discredit to Spyrotechnics, the second night was definitely the strong one in my opinion,” stated Sampieri. Before the announcements were made, firers from various companies also had the opportunity to meet Andrew “Freddie” Flintoff who was present with the crew from Sky TV to film his show Lord of the Fries. ‘When we were finally called into the reception for the announcement, a few of us filmed with him before they presented the results and unfortunately we weren’t looking our best! We were exhausted and still wrapped up with scarves and everything,’ said Willsher. ‘When third place was announced we were sitting there hoping our name wouldn’t be called out second and when they announced Spyrotechnics, the tension was building up but I was confident they were going to call out Fantastic Fireworks,’ said Sampieri. 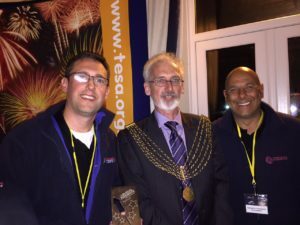 ‘Given the tiredness and hard conditions, it did seem really dreamlike that we had actually done it and it felt really good to see our managing director, Jon Culverhouse, really happy as we all began cheering,’ stated Willsher. The win made it a Double First for the 31-year-old designer, who earlier in the year had been awarded first class honours after completing a post-graduate degree in engineering. ‘The Plymouth event was enjoyable because it was well managed and they do oversee it and enforce the rules really well. Also, I’d like to thank everyone that contributed and supported us both on the day and prior to the event,’ added Sampieri.